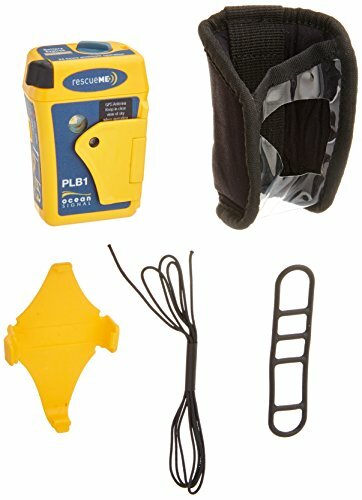 The ultra-compact rescueME PLB1 can be easily fitted into your lifejacket or onto a belt taking up minimal space and ensuring it is readily accessible. Wherever you are, at sea, on land, the rescueME PLB1 provides the reassurance that global emergency services can be alerted by the press of a button. The rescueMe PLB1 can be operated with a single hand in even the most challenging situations. A simple spring-loaded flap covers the activation button preventing inadvertent use. Once the emergency button is pressed your location will be sent to a rescue coordination centre via satellite. This SOS is then diverted to emergency services near to your location to aid rescue. The location will be continuously sent for up to 24 hours. rescueME PLB1 provides peace of mind on land or at sea allowing you to alert global emergency services of your location at the push of a button. This comes with comes with a flotation case to allow the device to floatation in a marine environment. Unlike most satellite enabled notification devices, the rescueME PLB1 requires no monthly or annual subscription, making it one of the most cost effective GPS enabled emergency beacons available for long term use. All Personal Locator Beacons sold by Orbital Satcom are pre-programmed with the US country code. Whilst they will function anywhere around the world, the first authority to be contacted in an emergency situation would be NOAA with whom the PLB would be registered. Please contact us if you wish to have your PLB shipped with configuration for use in a country other than US.